Moist and sweet, this tender cake with hints of cinnamon and bits of carrot is guaranteed to please everyone, whether you choose to make it a layer, Bundt or sheet cake. 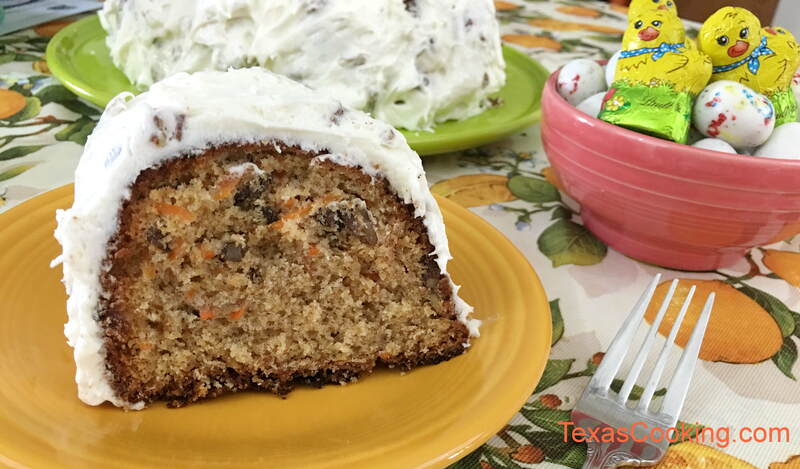 Add to its perfection with Cream Cheese Frosting and you'll have an heirloom cake to pass along to future generations. For a "from scratch" cake, this recipe comes together pretty quickly. You can save more time (and maybe some skinned knuckles) by using packaged grated carrots from the supermarket. In a large bowl, blend the oil and sugars on low speed of an electric mixer until well mixed. Add the vanilla. Beat in the eggs, one at a time, beating well after each addition. In a separate bowl, whisk together the flour, non-fat dry milk, baking powder, baking soda, salt, cinnamon and dried lemon peel. Gradually add the dry ingredients to the oil and sugar mixture until well blended. Fold in the pecans and carrots by hand. For a Layer Cake: Pour batter into two greased and floured 9-inch cake pans. Bake at 350°F for 35 to 40 minutes. Test with cake tester or toothpick. Cool before frosting. For a Tube or Bundt Cake: Pour batter into a 10-inch tube or large (10-cup) Bundt pan. Bake at 350°F for 50 to 60 minutes. Test with cake tester or toothpick. Cool in pan, then invert on serving plate and frost. For a Sheet Cake: Pour batter into a greased and floured 9x13-inch pan. Bake at 350°F for 45 to 55 minutes. Test with cake tester or toothpick. Cool before frosting. Note: Cream Cheese Frosting perfectly complements this cake.